Asparagus is a perennial vegetable that will spread in your garden over many years. If you have a plant that is growing vigorously, try propagating it to spread out your asparagus patch and increase the harvest. 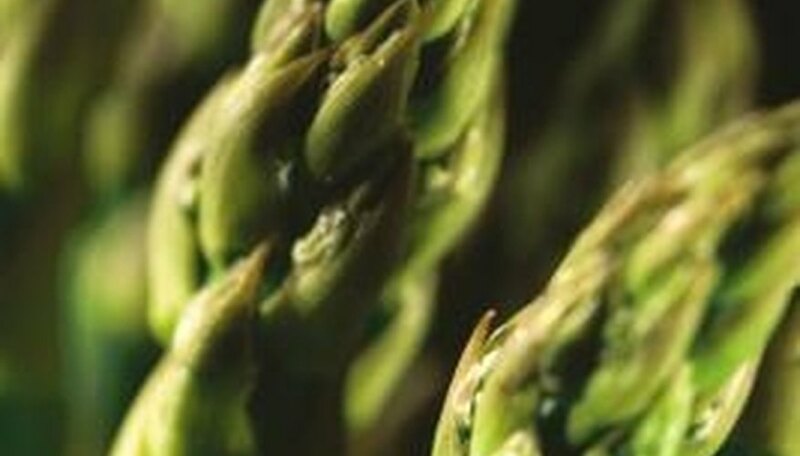 The seeds from the female asparagus will sprout if you plant them in the spring, but it will take at least a year longer to get a harvest than if you propagate with asparagus plant divisions. Take the time to prepare the site for planting your divisions. Dig down at least 12 inches and loosen the soil. Add in a shovelful of well-rotted compost for each hole. Use a trench if you are planting several rows of asparagus and add one shovelful of compost for each plant. Keep the planting hole about 8 inches deep and leave the unused soil at the side. Once the asparagus is established it is not so easy to fix the soil. Although asparagus starts from seed, the crowns -- the point where the roots become plant growth -- spread and are a much simpler way of increasing your asparagus patch. Lift the 1-year-old or more asparagus plant from the ground in the early spring. Trim off any unhealthy looking roots with a clean pair of pruning shears. Separate the mat of roots into separate plants, each with its own crown. Each of these will start a new clump of asparagus. When you plant the asparagus crowns, make a slight mound in the bottom of your trench, about2 inches high and lay the roots over the soil. Add a couple inches of dirt over the crowns and firm it slightly. As the weather warms, the sprouts will emerge through the soil. Keep adding another 2 inches of soil every week until you have filled the trench back in with soil. This will keep the roots deep so they don't get heaved up by winter frosts. Harvest your asparagus spears only until they start looking a little thin -- smaller than the thickness of a pencil. The plant needs to get energy from the fronds, so let them grow during the summer. They will form a stronger root base and possibly even set seeds to form new plants in the spring, expanding your number of plants.